The OxiMax MC Series is designed to produce Sodium Hypochlorite (NaOCl) from seawater. These heavy duty, high performance cells use an injection moulded PVC casing and a bipolar electrode arrangement for maximum energy efficiency and Hypochlorite production. Power Stations, refineries and Industrial complexes near the sea are the perfect applications for the OxiMax MC Series Electrochlorination Systems. Whenever seawater is used for cooling, treatment of the seawater is required to control marine growth. The raw materials of seawater and power necessary for production of Hypochlorite are readily available – seawater is free and the power used is only the cost. A side stream of seawater is taken from the discharge of the water pumps directly to the EC Plant. This seawater is strained to 400 micron and passed into the electrolyser cells. DC power is applied to the seawater inside the cells which results in the production of Hypochlorite. The OxiMax MC Series employs staged removal of the hydrogen (H2) throughout the electrolyser train via multiple hydrogen cyclones, resulting in superior Hypochlorite production and energy savings. All H2 is passed to either the degassing/storage tanks or to H2 seal pots. The H2 is then diluted and purged to the atmosphere. The Hypochlorite leaves the last cell and is passed to the degassing/storage tanks where it is stored for dosing to the sea water inlets. Dosing to the sea water intakes prevents biofouling of the mechanical equipment such as the cooling water pumps, the bar screens, drum screens and condensers as well as the cooling water pipelines of the power station. The OxiMax MC Series system is controlled by PLC with Touch Screen operator interface for ease of control. the need for acid cleaning. 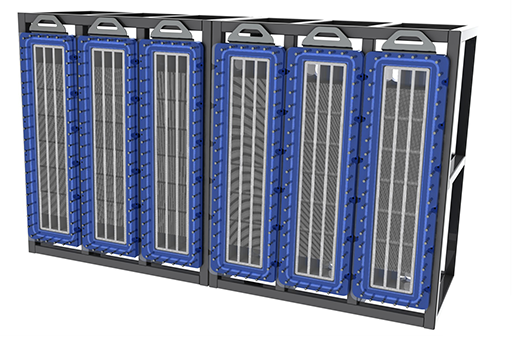 If you require 120kg/hr of Cl2 cells equivalent, we would offer an MCC120000 = 12 x MCC (10 kg/hr) cells or an MCC120000/8 = 8 x MCC (15kg/hr) cells.